I'm very excited for Martin Luther King Day this year. 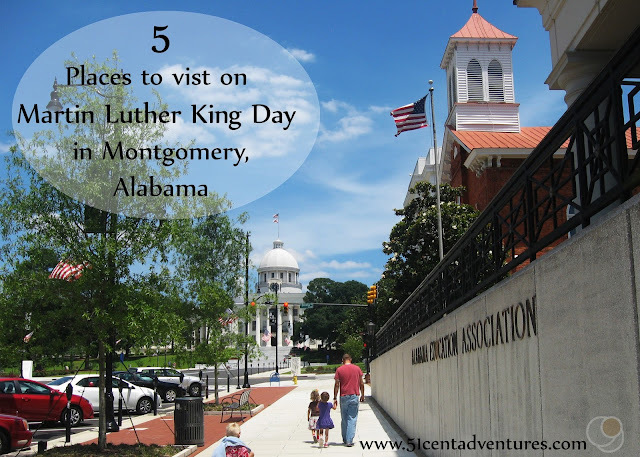 My family currently lives an hour an a half away from Montgomery, Alabama, and so we are planning to go up there to visit places where Dr. King did important things with the Civil Rights Movement. Dr. King lived in Montgomery from 1954 to 1960. During that time his work with the Civil Rights Movement was influential in changing not only the city, but also the world. Many of the places where civil rights events happened have been turned into monuments to the movement. I started out just making a little list of the places I wanted to visit with my family. I thought I'd do a post all about them after we got home from our visit. But I realized that I should share what I learned now so that you can use it to plan a trip to visit these places on Martin Luther King Day too. I've added a few pictures from a trip my family took to Montgomery in May of 2015. So here are 5 places to visit on Martin Luther King Day in Montgomery, Alabama. 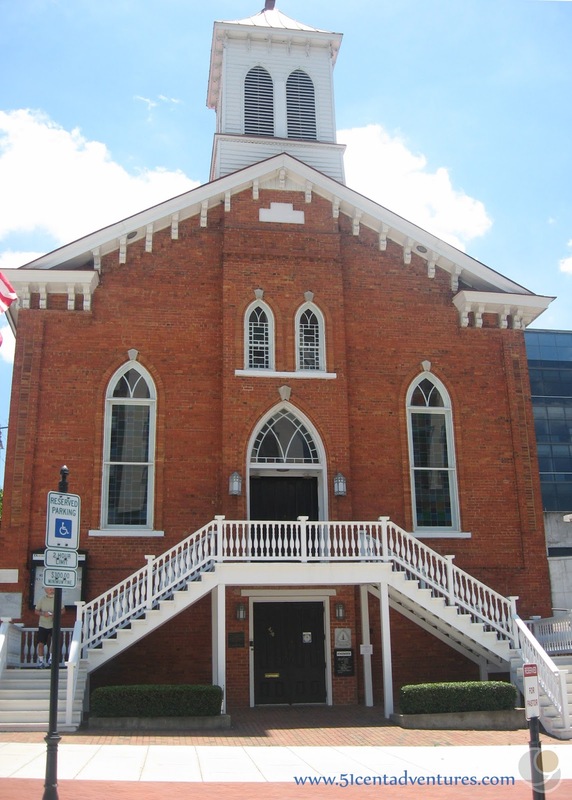 What better place to observe Martin Luther King day than at a church where he was a pastor? Dr. King was the pastor of this church from 1954-1960. From here he helped organize the Montgomery Bus Boycotts in 1955. The parsonage where Dr. King lived with his young family is located several blocks from the church. Its has been redone to appear as it did back when Dr King lived here. The address for the parsonage is 309 S Jackson Street. During the week the church and the parsonage are open for tours. Tours are available on the hour from Tuesday through Saturday starting at 10:00 am. Reservations are required for the tours. The church is still an operating church and everyone is welcome to worship with the congregation on Sundays. Even though Martin Luther King day is on a Monday the church will be open for tours. Reservations will not be required on this day either. The cost of a tour is $7.50 adults and $5.50 for children. The State Capitol is located across the street from the Dexter Avenue King Memorial Church. As you walk up Dexter Avenue from the church you will be walking on the same path that the members of the Selma to Montgomery March traveled. 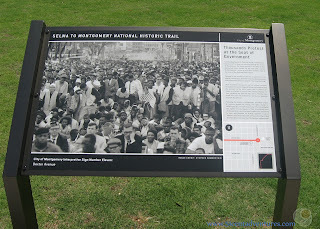 On the grounds there are several information plaques detailing events from the Selma to Montgomery marches. These marches were held in 1965 to protest the systematic exclusion of African Americans from registering to vote. Dr. King was involved in organizing the marches and gave his "How Long, Not Long speech in front of the capitol at the conclusion of the main march. The capitol will be closed for the holiday, but on normal weekdays you can take a free tour of the state capitol. The visitor entrance to the capitol is located at the back of the building. Self guided tours are available from Monday to Friday from 9:00 to 4:00. Self guided tours are not available on Saturdays but you can join a guided tour at 11:00, 1:00, or 3:00. For more information visit http://www.preserveala.org/capitoltour.htm or call (334) 242-0347. The Civil Rights Memorial is a black granite slab with water flowing across it. The names of people who were killed during the Civil Rights Movement are listed on the monument along with a chronology of important events. The monument is located in a open plaza across the street from the Southern Poverty Law Center. It is free to visit and always accessible. The Civil Rights Memorial Center is located next to the memorial. It features exhibits about the people who died during the civil rights movement. Admission is $2 per adult, and children under the age of 18 are free. The center will wave the fee on Martin Luther King Day. For more information about the Memorial and the Memorial Center visit https://www.splcenter.org/civil-rights-memorial or call 334-956-8439. This museum is located on the spot where Rosa Parks famously refused to give up her bus seat to a white man on December 1, 1955. She was arrested and four days later she was found guilty of disorderly conduct. The afternoon of the trail The Montgomery Improvement Association was formed and Dr. Martin Luther King was selected as president. The bus boycott was started that same day as the trial. It lasted 382 days, and ended when the segregated service was ruled unconstitutional by the United States Supreme Court. The museum is open Monday through Friday 9:00-5:00 (last tour at 4:00) and on Saturday from 9:00 to 3:00. The Freedom Riders had already been treated violently in South Carolina; Anniston, Alabama; and Birmingham, Alabama before they reached Montgomery. In Montgomery they were met with a mob of 200 people carrying baseball bats and metal pipes. Twenty people were seriously injured in the ensuing beating. Dr. King was living in Georgia at the time of the incident. After the incident he came to Montgomery, and gave a speech in support of the Freedom Riders. The US Marshals were called in to protect Dr. King and his supporters from another angry mob. As with everything there are many more interesting details to this story. I highly suggest you read this article by the National Park Service about what happened at the Montgomery Greyhound station. The museum is open on Fridays and Saturdays from 12:00 to 4:00. I was unable to find out if the museum will be open on Monday for Martin Luther King Day. Even if the museum is not open there are exhibit panels on the outside that tell the Freedom Riders' Story. These are free to view and always accessible. The cost of admission to the inside of the museum is $5 for adults, and $3 for children ages 6 to 18. I'm hoping that we will be able to visit all 5 of these places on Martin Luther King Day. They are all located within a mile of each other so it shouldn't be too much of a problem to visit all of them. There will be free parking on this holiday so that will make it even easier to visit these places. If you have time, I highly suggest you drive out to Selma and visit the sights along the Selma to Montgomery National Historic Trail (Highway 80). There are several interpretive centers along the 54 mile drive. 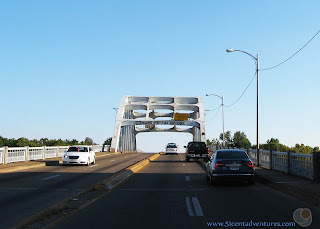 When you get to Selma you will cross over the Historic Edmund Pettus Bridge. This is where marches were attacked by the National Guard while cameras broadcast the event on live TV. The event took place on March 7, 1965 and became known as Bloody Sunday. The National Voting Rights Museum is located at the foot of the bridge. 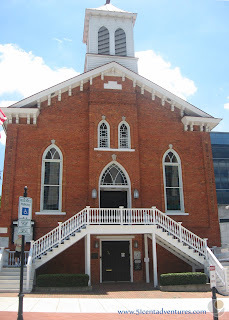 In Selma you can visit the Selma Interpretive Center, located at the intersection of Water Ave. and Broad St. You can also visit the Brown Chapel AME Church where the marches were organized. And you can also take a walking tour on Martin Luther King Street. Birmingham is another city where important things happened during the Civil Rights movement. Birmingham is located 90 miles north of Montgomery. 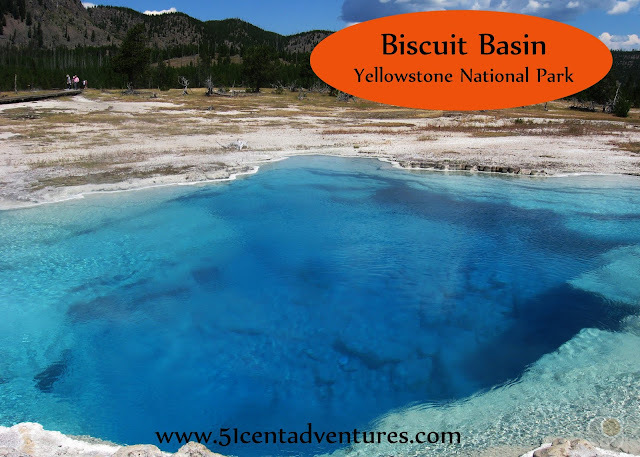 If you have time to make the drive there are several places you should visit. 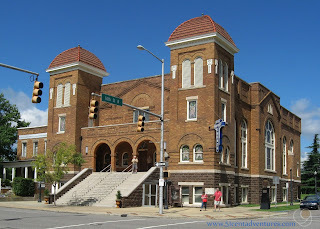 Probably the most famous place to visit is the Sixteenth Street Baptist Church in downtown Birmingham. This is the location where four young girls were killed by a bomb in 1963. Across the street from the church is Kelly Ingram Park where civil rights demonstrations were held to protest the parks' segregation from African Americans. The Birmingham Civil Rights Institute is located near the church and park and contains many exhibits that teach about the importance of the Civil Rights movement. I'm very excited to visit these places. I want my children to know that Martin Luther King Day is much more than just a day off of school and work. So how did it go? Click here to find out.